Sir John Cheke was born on 16th June 1514 to Peter Cheke and he was educated at St John’s College, Cambridge where he became a fellow in 1529, whilst at Cambridge Cheke adopted the principal beliefs of the Reformation. His learning and reputation earned him the chair of Greek in 1540. Amongst his pupils were William Cecil, who later married Cheke’s sister, and Roger Ascham, who later in The Scholemaster praised Cheke. On 10th July 1544 Cheke was appointed as tutor to the future King, Edward. He was appointed to teach him ‘of toungues, of the scripture, of philosophie and all liberal sciences.’ Cheke continued in this position after Edward’s ascension to the throne. 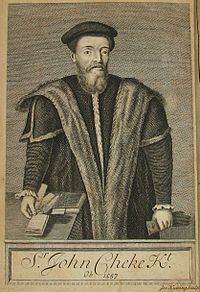 Cheke was active in his public life; he was the Member of Parliament for Bletchingley in 1547 and 1552-53. In 1548 he was made provost of King’s College, Cambridge and was a commissioner that visited that the college along with the University of Oxford and Eton College and he was appointed alongside seven divines to draw a body of laws for the governance of the church. On 11th October 1551 Cheke was knighted and in June 1553 he was appointed as one of the secretaries of state and joined the Privy Council. Following the death of King Edward VI, Cheke followed the Duke of Norfolk in backing Lady Jane Grey and was appointed to the office of Secretary of State during her nine days as Queen. When Queen Mary I took the throne she placed Cheke in the Tower of London and confiscated all his property. He was released on 3rd September 1554 and was given permission to travel abroad where he first visited Basel before moving onto Italy and then finally settled in Strasbourg where he taught Greek. In 1556 Cheke travelled to Brussels to visit his wife but on the return journey between Brussels and Antwerp he was arrested with Sir Peter Carew on the orders of King Philip II and taken back to England where he was sent to the Tower of London. Whilst imprisoned in the Tower he was visited by two priests and Dr John Feckenham, dean of St Paul’s, Cheke had attempted to convert them to Protestantism and now in prison he feared being burned at the stake and so in an attempt to be saved he converted to Catholicism. On 15th July Cheke wrote a letter from the Tower regarding his belief in Catholicism in the hope that he would be spared making a public recantation. Cheke also wrote to the Queen in which he declared that he was willing to obey the law regarding religion. Cheke was forced to make a public recantation on 4th October after a further two months in the Tower. He was made to read the longer form of recantation in front of the court and agreed to perform whatever penances the legate wished to pass. With all the humiliating recantations out of the way he was finally released from the Tower and was allowed to regain his lands that he was earlier forced to give up. Ashamed of abandoning his faith Cheke died on 13th September 1557 in London at the home of Peter Osborne, friend and remembrancer of the exchequer. He was buried in the north chapel of St Alban’s where a momument was built in his memory.